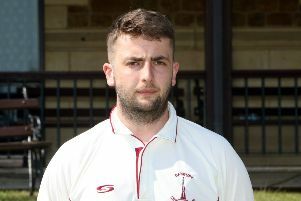 Qaasim Adams completed his maiden Home Counties Premier Cricket League century for Banbury but it wasn’t enough to gain maximum points a Oxford. Banbury had to be content with a draw in Saturday’s division one fixture at Jordan Hill where Lloyd Sabin’s side set a healthy target of 255-6 when the skipper declared in the 63rd over. But it began poorly for the visitors as they were reduced to 3-2 after Craig Haupt was trapped lbw by Robert Keat who then bowled Oliver Clarke. Sabin and Adams set about rebuilding the innings and the pair put on 195 runs for the third wicket. Sabin was caught by David Murphy off Shamilal Mendis for 82 runs which included seven fours and a six. Adams remained at the crease to put on another 34 runs with Richard West before he was bowled by Freddie Simon for 123 runs off 171 balls, which included 14 fours and a six. West soon followed having scored 12 runs before Sabin called his players off with Graham Beer 13no and Steven Green out in the middle. In reply, Banbury soon had Oxford in all sorts of trouble at 5-3 after Brad Taylor bowled opener Calvin Dickinson and Clarke took out Aadam Samiullah and Muhammad Ayub. Opener Fergus Nutt proved harder to crack as he held together the Oxford innings and the hosts clawed their way to 62-6. Jamie Parkin weighed in with a useful 21 runs before he was bowled by Clarke, one of his three victims, and Nutt was finally trapped lbw by West for 24 runs. Banbury still looked on course for the victory but Murphy 14no and Simon 22no dug in to keep Oxford in the contest as they saw out the remaining overs to finish on 122-7 and deny Sabin’s side maximum points. Clarke finished with 3-26 while West took 2-23 but the day belonged to century-maker Adams.